I took a museum and stadium tour. It’s possible to only visit the stadium but I’d recommend seeing the museum too. The Estadio Da Luz stadium is located on the blue line of the Lisbon metro. You can arrive at either Alto Dos Moinhos or Luz stations and it’s a short walk to the stadium. I was staying at the 1908 Lisboa hotel close to the Intendente station so had one change at Baixa Chiado. It takes about 15-20 minutes to get to the stadium by metro. You buy your stadium tour ticket in the very impressive club shop. There are snack bars and other kiosks around the shop too. 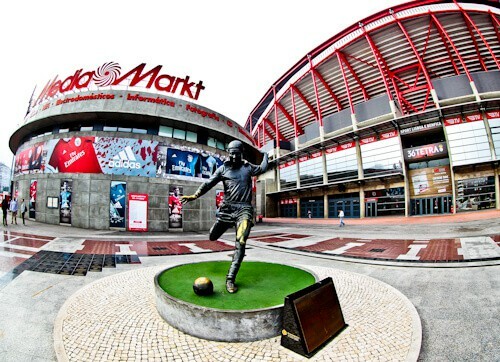 Outside the club shop complex is a statue of the Benfica and Portuguese legend Eusebio. If you don’t know who he is you’ll learn about him in the museum. He is still regarded to be the best Portuguese player in history despite the recent success of Cristiano Ronaldo. In the stadium you are taken to various vantage points. This will allow you to take photos of different angles of the stadium. 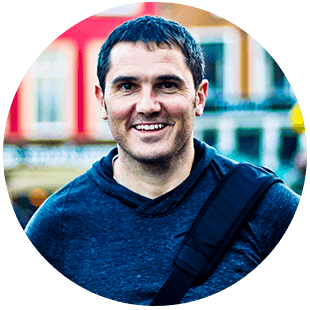 You are given plenty of time to do this and don’t be afraid to ask your guide to take your picture. The stadium is very impressive and very similar looking to the Emirates in London (Arsenal FC). Estadio da Luz has a capacity of over 65,000 people and is the largest stadium in Portugal. It is written in latin before you walk down the tunnel, ‘e pluribus unum’. This translates to ‘out of many, one’ and signifies unity. 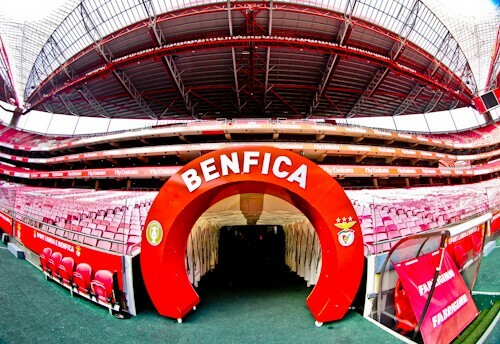 You can walk down the famous players tunnel which the Benfica greats walk down each game. A good photo opportunity awaits at the end of the tunnel. You can get a picture at the end of the tunnel where it says Benfica with the stadium behind. The dugouts are located on each side of the players tunnel. The home dugout is on the right as you walk out. An interesting fact about the dugouts is that the legendary Portuguese manager Jose Mourinho has sat on both sides. He was the Benfica manager for 2 months. He has since returned with teams such as Porto and Manchester United to sit in the away dugout. The nickname and symbol of Benfica is an eagle. You’ll see an eagle on their club logo. 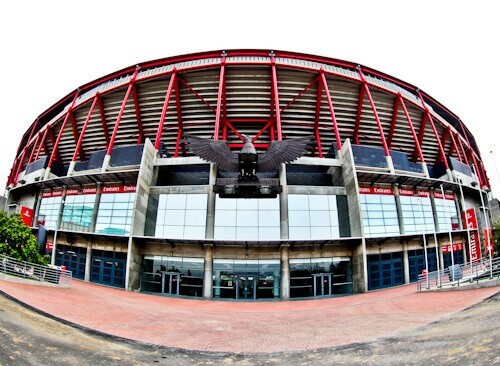 Before every Benfica game an eagle will fly around the stadium. 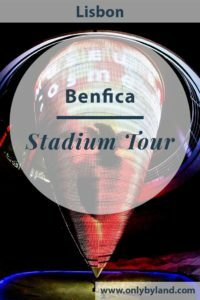 On the stadium tour you will see the Benfica eagles. If you’re taking a stadium tour with kids I am sure this will be their favorite part. There’s an interesting story that one Benfica fan had one of the Benfica eagles as a guest of honor at his wedding. I hope his wife was a Benfica fan too! 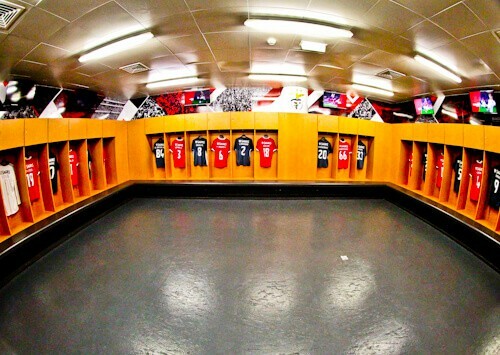 The away team dressing rooms are impressive compared to those of Newcastle and Liverpool. 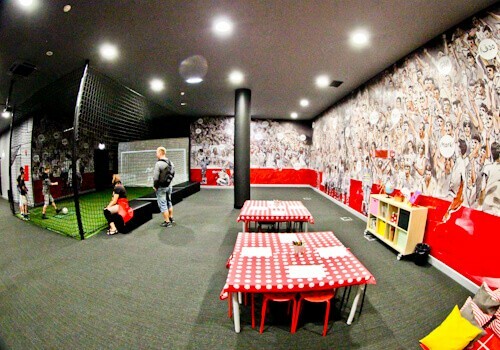 When English teams come play in Benfica they must be surprised how fair the facilities are. The decoration of the dressing rooms however let you know who you are playing against. 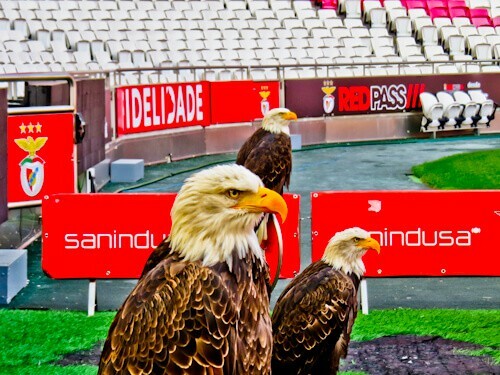 You will see pictures of the team eagle, Benfica legends and lots of red. You are not permitted to enter the home team dressing room. I would imagine if the home dressing room is as advanced and well thought out as the rest of the stadium that it gives Benfica a huge home advantage. The successful Portuguese national team also benefit from the use of the home team dressing room when they play here. There was one occasion when Real Madrid had access to the home dressing room. During the champions league final of 2014 they beat Athletico Madrid in the final. Would Athletico Madrid have won if they had been in the home dressing room? 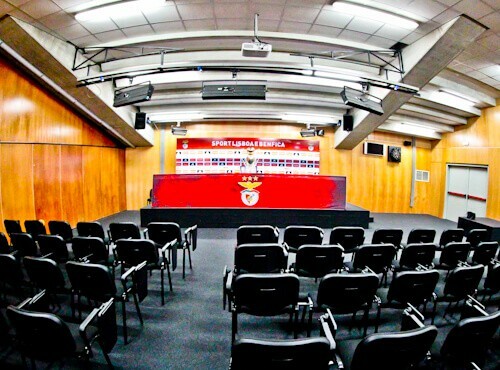 In the Benfica press room you can sit where the manager does for press conferences. On this stadium tour you are treated to being able to sit there with the Portuguese championship trophy. A picture here holding the trophy will go well on your Facebook or Instagram feed. For those visiting as a family it will make a wonderful family memory. For the Euro 2004 cup final and 2014 Champions League final the size of the press room increased due to media attention. They increase the size by removing the walls on the left. 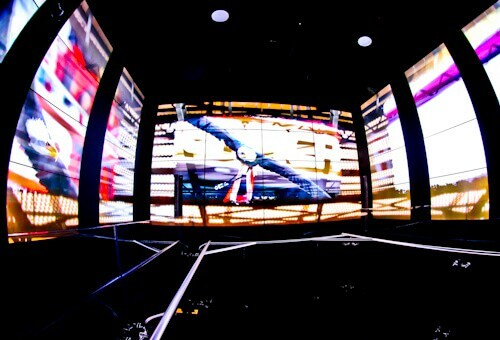 Benfica has the most interesting football museum I have ever been in. Not only do you learn about Benfica and its history but you learn about what has been happening in the city of Lisbon as well. You’ll see a world map stating all the countries that Benfica have played in. There is another map stating all the foreigners by country who have played for Benfica. You can search for your country and see which players have played for Benfica. There is a Eusebio section to the museum. The more I read and learn about him, the more I respect him. Benfica won back to back European cups in the 60’s when Eusebio was a player. 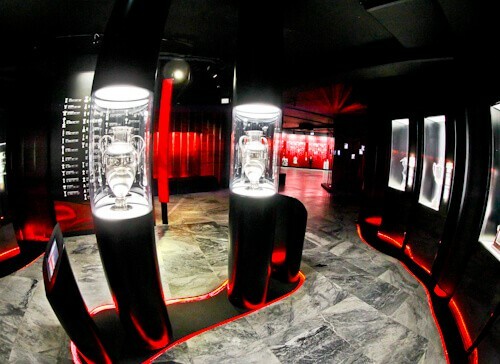 You’ll see replicas of these trophies on display in the museum (above). 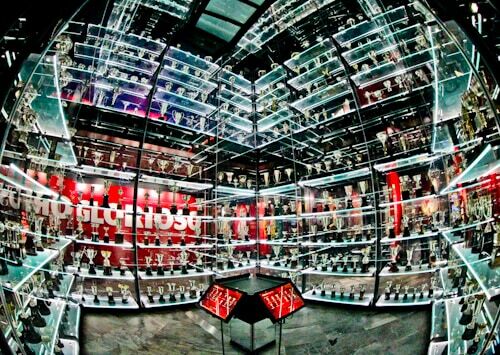 Benfica have one of the most impressive trophy cabinets you’ll ever see. Walking into the trophy cabinet is worth the museum entry fee in itself! What is scary is that it’s probably only a fraction of the trophies they have in their collection. Throughout the museum you’ll see lots of unique trophies, some of them are probably bigger than your kids. 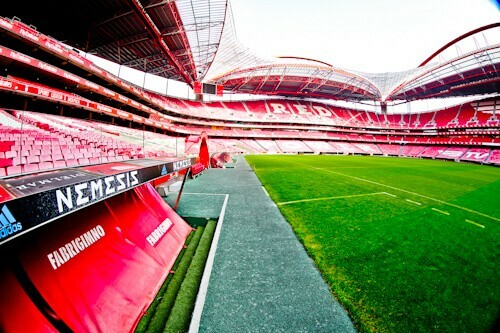 Kids will love to see the eagles of Benfica and of course the stadium where so many greats have played. In the museum there are lots of interactive experiences for them to learn about the club and city. There is an area where they can take a penalty against a virtual goalkeeper which I’m sure will keep them occupied for quite some time. For the younger ones there is a section where they can sit and play. There is a 7 minute elevator ride which lifts you up through the 3 floors of the museum. You are surrounded by movie screens. The movie really captures the atmosphere of the stadium. As you reach the top you see the eagle souring around the pitch before a game. On the lower levels are the fans and of course the players on the pitch. Enjoy your Benfica stadium tour. Estadio da Luz is one of the best stadiums in the world. 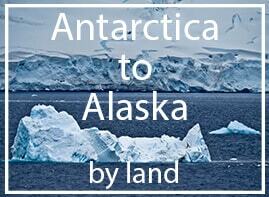 This is complimented by friendly guides, good organisation and presentation. The only way you could have a better experience than a stadium tour is if you were to watch a live game. Check the Estadio da Luz fixtures before planning your visit. Where to stay in Lisbon, also what to see in Lisbon and Sintra. Furthermore, why not take a Sporting Lisbon Stadium Tour. Estadio da Luz is huge, I had no idea this was in Lisbon!. I remember Portugal losing to Greece in the Euro final, now I know where! Now that’s what you call an impressive trophy room! The 7-minute elevator ride is a great addition to seeing the museum. It’s times like this when I read about football stadium and all the energy and tears that happen here, that I wish I was more into football! Also never knew about Eusebio (Ronaldo yes! ), so thank you for telling me! Wow, your photo of the stadium is amazing. I would love to see a live game there, the Eagle flying over at the start must really set the atmosphere. I didn’t know they were double European champions in the 60’s, such an impressive history! Benfica stadium with museum must be exciting for football lovers. As I am not very much sport lover but would love to see its museum. The dressing room looks so elegant. I would also love to see trophy cabinet as most glorious moments are stored here. Great to know about the Benfica eagle. You’re right. The stadium does remind me of Emirates Stadium. I’m hoping to visit Lisbon in 2018 and my guy being a big time football fan I guess Benfica would definitely make it to my itinerary. Thanks for the tip that the Museum is also worth visiting. Eagle as guest of honor at wedding??? OMG!!! Wow James, I must say your Stadium Tours are getting more and more impressive! We had the chance to see Lisbon this summer but we missed this very impressive stadium. I really like the focus here on all these details, especially this incredible good looking design. In combination with their colors, mainly this signal red you can already feel the heat and passion during the matches. The story with the eagle for the wedding is really a bit crazy but I think for a die hard fan obviously a kind of life dream that comes true with this. Good to see, that the club supports its fans also with such actions! I am sorry but I have to ask a very naive question… Why is this stadium named the Stadium of Light? Lisbon is quite rainy hehehe. I am a strong FC Barcelona follower and I think that nothing beats our Camp Nou, but this tour seems like a beautiful way to spend a day on town! Quite an impressive trophy room! Am sure for fans it must be so exciting to walk around in such a place – I have never managed to get excited about football, only when my homeland (Denmark) does something nice. haha – However no doubt that the quality of the home changing rooms and all the money injected into a team like Benfica makes it one of the good teams in Europe and the greatest in Portugal. I’m a football fan but don’t really follow any teams. However, I love visiting stadiums and sport complexes because there’s a certain grandness to them that is amazing to photograph or just experience. You’ve really captured the stadium beautifully with the wide angle shots and that trophy cabinet really looks spectacular. I am no soccer fan but I love sports! I would imagine this would be a fun visit for the fans of the team! But if it popular locally, I would love to visit it when in the area. It’s a good way to immerse yourself into the local culture, especially the museum. 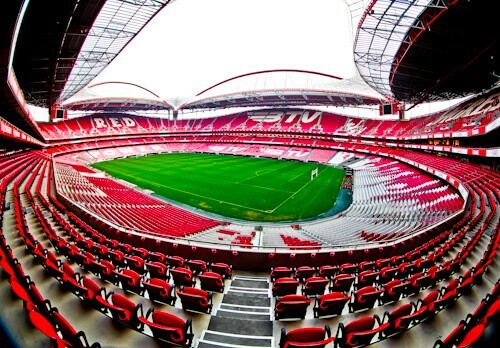 I didn’t realize Benfica had such a world class stadium. I will definitely take a stadium tour next time I pass through Lisbon. The trophy cabinet looks amazing! This article took me back to my childhood! I lived very very close to Estadio da Luz and I’ve watched a couple of games there as well. The last one was the Euro 2004 England – France. We missed this one on our trip to Lisbon last year! Looks glorious 🙂 I love the vibes of stadiums… trophies… team history, jerseys, dressing rooms and of course imagining live action on field with the crowd going insane! Not a football fan, but the vibe is everything!